Southern New England is a haunted place — no surprise there considering all of the history that took place in the region, but what is surprising is just how many locations claim to have ghosts! 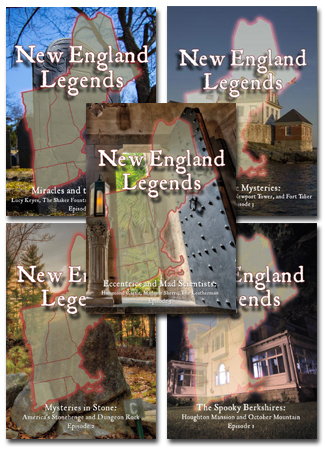 Recently Ghostvillage.com caught up with author Andrew Lake to talk about his first book, and his numerous investigations into the haunts of southern New England. Why is southern New England so haunted? Andrew Lake: Southern New England has a very long history of people battling to overcome life-threatening adversities. From nature’s harsh elements and disease to social/political tyranny and armed conflicts, many from New England’s past lived hard lives and died some pretty nasty and lonely deaths. I believe these struggles have emotionally and psychically scarred the environment. The environment and geology of southern New England may play a part as well. Its mineral deposits, running water, and erratic weather patterns could possibly act as spiritual energy conductors, giving ‘life’ to the region’s haunts. Tell us about your first paranormal investigation. Where and when was it? What happened? My first two ghostly encounters came about by chance, not through research and planed investigation. Years later, I lived in an old house in Scituate, Rhode Island, that was haunted, but I let those ghosts do as they liked and just observed and noted their activity. I never tried to capture proof that they were there, I just accepted them. My first true investigation was in October of 2006. It took place in a wooded area in Foster, Rhode Island. I had been told the spot was the location of a nineteenth century woolen mill known as the Ram Tail Factory. That information turned out to be incorrect. The business that once stood on the spot was a dairy farm. For many years, people have reported seeing a phantom lantern light moving around the old ruins well after sunset. The ghostly light was assumed to be the spirit of Peleg Walker, a man who had killed himself at the Ram Tail Factory in 1822. The old mill is actually located about a mile away along the banks of the Ponaganset River. I believe the lantern light belongs to the ghost of a dairy farmer who is still going to his barn to give the cows their last milking. Whoever the ghost is, a friend and I saw this eerie light for ourselves, twice in one evening. The two of us had only been at the location for about three minutes when we encountered a ball of light moving down the old carriage trail towards us with a slow, swaying motion. There was a full moon out that night and I had brought a night vision scope with me. The night scope showed us that there was no one holding the light. When it was about thirty yards from us, my friend ran away with the scope, leaving me standing there in the middle of the trail with this advancing specter. I decide to take off after him and found my friend not far away, lying down on top of a small hillock. I joined him and together we watched this light move slowly back down the trail and disappear. We hunted the thick forest for a logical explanation for what we had just seen. We heard no footsteps accompanying the light and could not understand why this strange glow didn’t illuminate the woods around it. An hour later, as we were leaving the site to head back to my car, the light reappeared. It was following us through the woods on an old path that paralleled the trail we were walking on. My friend stayed still and watched it through the night scope while I tried to flank it. By the time I reached the spot where it should have been, it was gone. We are certain that if it had been a living person we would have heard the sound of dried twigs snapping under foot and a conventional light would have illuminated the woods all around. I went back a year later and briefly caught the light on video. You can see a freeze frame from the video at my web site, www.greenvilleparanormal.com, as well as a photograph that was taken years ago by a member of N.E.A.R. showing a similar light in the same location. This spot is still one of my favorite places to investigate. Being a Rhode Island guy and doing this for years, you no doubt heard about most of the haunts in your region and state. Was it more difficult to find the haunts when you got further from home? What were your criteria for including a location in your book? The editor for Clerisy Press’s “America’s Haunted Road Trip” series, John Kachuba, gave me the guidelines for the book. I was told to find haunted places that offered something other than just ghost stories. My mission was to find restaurants, hotels, B&Bs, museums, historic homes and interesting shops which have a haunted reputation. That narrowed the field a bit. There are many cemeteries, abandoned buildings and back roads in southern New England that are said to be haunted, but most are inappropriate for the general public to visit. They also don’t offer a good meal or a warm bed for the night. I did write about a couple of locations that aren’t businesses, but are great outdoor places for folks to take a drive to and enjoy some New England charm while they hunt for ghosts. It was a challenge to find locations for this book. I had to visit all the places I wrote about and conduct fresh interviews with the owners, managers and staff, as well as take pictures. There were a few places which told me straight out that they did not want to talk to me about ghost and did not want to even be mentioned in my book. Some spots had gone out of business and a couple had burned down. Another factor that made it difficult to write about a location’s ghost stories were brand new owners and staff who knew very little about their building’s haunted reputation and hadn’t experienced anything there themselves. Distance from my home in Rhode Island didn’t really work against me. Being a paranormal researcher and investigator, I am very familiar with many of the haunted locales in southern New England. Getting people to warm up to the idea of letting me come visit and talked to them about their ghosts was sometimes the tricky part, especially in Connecticut. Why that was, I really don’t know. Did you have any frightening moments (besides your deadlines) during your research into these places? No. The deadline was the only thing that made me feel uneasy. Do you feel like any witnesses may have been lying to you to get some publicity? That was a problem I thought I might run into while looking for locations. I always kept it in mind while I was interviewing people. I am glad to say that I never did detected anyone being dishonest with me just so they could get their place into a guide book which might bring them some business. What’s your favorite Southern New England haunt and why? The hamlet of Hopkins Mills in Foster, Rhode Island. It is where I saw the phantom light I mentioned earlier. There are a few ghosts that haunt this vicinity and people are still seeing them to this day. I have seen strange lights, besides the lantern light, and captured some spooky EVPs in Hopkins Mills. Another hamlet in Foster, Moosup Valley, has a stretch of road haunted by the ghost of a man carrying a shovel over his shoulder. I caught a strange anomaly in a picture there as well as something on video flying into the cemetery. Besides being rich with ghost stories, Foster has held onto its history and natural beauty. It is one of the few unspoiled towns in Rhode Island. It could possibly be the most haunted place in all of southern New England. What’s a funny moment that happened during your research? Now that you’re done writing, what location are you dying to go back and investigate? I would truly like to investigate all of them. Ventfort Hall in Lenox, Massachusetts, the Mark Twain House, The Victorian in Gardner, Massachusetts, and Saint Ann’s in Woonsocket, Rhode Island are at the top of my list. What’s your favorite piece of paranormal research equipment and why? My good friend Pamela Patalano. She is a genuine psychic who has turned non-believers into believers. Her hits are detailed and have been verified through interviews and historical research. My infrared camera is pretty cool and I can’t go anywhere without my digital audio recorder, but Pamela is the real deal and she has proven to be most valuable during investigations. Pam also has the ability to calm home owners and tenants who are rattled by the possibility that their home or apartment maybe haunted. Greenville Paranormal Research is very fortunate to have her as a member of our team. Which New England state is most haunted? Massachusetts is obviously larger and it has many haunted sites. I think Connecticut is very haunted, but people there are very tight-lipped about their ghosts, so the number of both public and private places with a haunted reputation is hard to know. When you consider how small Rhode Island is and then take into account that there are whole towns and villages, such as Foster, Glocester, Scituate, Cumberland and Smithfield which have several haunted spots within their confines, I would have to answer with Rhode Island. What’s the one song that forces you to play air guitar every time? “London Calling” by The Clash.